I have to say, this is the post I've been most anxious to get to... I would like to call it "The Day Things Got a Whole Lot Better"!!!!!! This was what I had been hoping for!!! When I toured this nursing community, they told me their third floor had 20 beds and was their "serenity" "memory care" floor. On one of my tours, I did ask to see the third floor. I remembered it was very calm, quiet, and I just instinctively knew that was where my mom should be. However, I don't think you can "request" to be there -- it is based on evaluation and availability. The truth is, I hoped that if I stayed quiet and let them see my mom's needs that she would eventually be moved out of that dinky little room. I also don't think it was a coincidence that I received this call three weeks to the day that my mom moved in. After I got the lump out of my throat, I said, "Yes, that would be wonderful - I think that is where she belongs." Although mostly happy, I'd be lying if I didn't say that it still hurts my heart when a health care professional validates what I already know, which is that my mom needs a higher level of care and that she is unable to engage socially on her own. They said, "great, then we will probably move her this morning or this afternoon". They said I did not need to be there. That was also good news, as I wasn't sure I could be there right away. However, my mom's BFF, Jane, had also planned to visit that same day. I let her know about the last minute move and she and her husband kept their plan to visit thinking their being there might also help my mom make this transition. I was so relieved!!! As you know, it was difficult but a big relief for me to move my mom into this skilled nursing community. This news of a move to memory care was when I really started feeling better about everything! Although I don't have pictures of my mom's visit with her BFF, I did hear it went very well. They stayed with my mom for several hours and joined in on the activities and watched my mom's physical therapy. They were impressed by the attentiveness that the staff gave and how residents were not just left sitting in their rooms, but were being engaged in activities. I was anxious to get over to visit and was able to do so later that evening. Apparently, I had just missed my mom's friends, but I can tell you this was my best visit thus far!!! Her room was much larger and in a nice corner location with a window overlooking the main entrance. The picture below is taken standing in my mom's doorway. A fish tank to the left and a tv/sitting area to the right just outside her door. 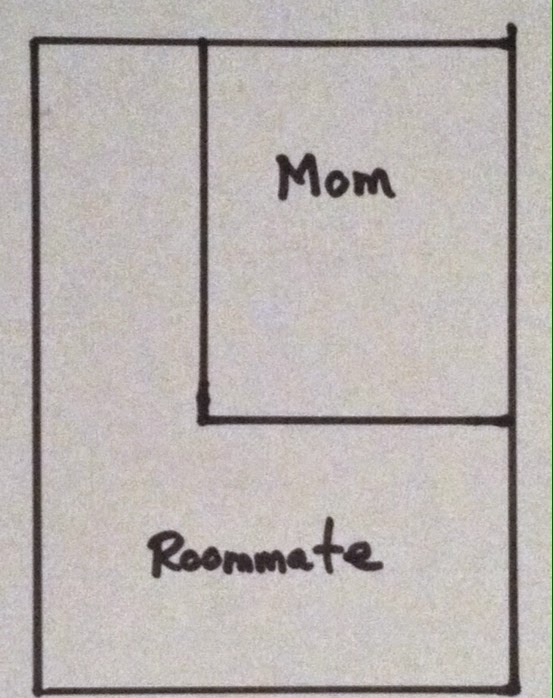 This (below) is my mom's roommate's area. Her roommate's name is Joy. She is extremely quiet and I don't think she sees well or speaks very much. She looks like a nice lady, and I hope that one of these days I will learn more about her. Below is my mom's side of the room. A nice bright window, a chair for us to visit and a much bigger space. This is the view looking down the hall from my mom's doorway. The television is right next to the plant. One funny side note that I had totally forgotten about... There are two cats that live on this floor. The first day I was there they jumped on my mom's bed. I had to laugh to myself because I am allergic to cats and have no idea whether my mom is as we have never owned cats. The cat below is "exactly" like one of the cats my husband owned when I met him. I loved that cat! My allergies seem to only come into play if I pet them excessively or if they sleep on my blankets or bedding. Thankfully, they have had no affect on me or my mom, but I couldn't help but wonder what would happen if a resident was allergic. I can tell you it would have to be pretty serious before I would prevent my mom from living on this floor!! One of my next visits she had "wings" on her wheelchair -- I think they had some kind of wheelchair beautification day!? Doesn't she even seem happier!? Here a physical therapist is getting ready to work with her. She used her walker and walked me to the elevator. She did pretty good, but still needs the wheelchair. I am slowly adding some photos and trying to make this room look more like my mom's own. finish my wall décor yet!! I love the light coming through my mom's window as the last room was often dark because there was only one shared window as her roommate was usually sleeping. Never hurts to have a few angels around either. Things are looking up!!!! Phew!! Reliving all of that has been a lot (probably for you, too!) -- that's why I took a little time away to regroup a bit. Moving my mom July 3rd and then leaving for the holiday weekend was a lot!! Over the weekend, of course I was worried if my mom was sleeping or asking lots of questions about where she was. Obviously, I was grateful that we were somehow able to move her in without upsetting her, but I still couldn't help but wonder if our good luck would continue. I was relieved to know that regardless of how she was, there would be plenty of staff around to help her. As soon as the weekend was over, Kristin and I went over to see how Grandma was doing. This is how we found her...sitting in her room in the wheelchair watching some tv. I was relieved and remember thinking that she looked fairly well rested. My only fear in anticipation of this "first visit" was whether she would ask me to "go home" or something like that. Kristin went across the hall and watched the birds with Grandma while I did some snooping and met some of the staff. They needed me to inventory all of my mom's possessions and make sure all of her clothing was labeled with her full name. Although I had hastily done some of this before the last minute move, I still had more to do. Even though there wasn't much, it was a bit tedious and I wished I had some iron on clothing labels. While in my mom's room, I noticed this note with my mom's things. Obviously, my mom had asked where she was and one of the nurse's had taken the time to write her name and the name of my mom's new home. This made my heart sink for a moment, but I was glad someone had taken the time to try to help my mom understand. The change in her surroundings is significant enough that it would be more alarming if she did not ever question it. My sister-in-law and her mom also stopped by with Matt, my mom's grandson. I know how important it is for my mom to see familiar faces while going through this transition, so I was very grateful they took the time to visit. Always Nice to Know She Had Some Company! I still was a bit bothered by how very small my mom's room was, but I was encouraged that there seemed to be more attention from the staff and that everyone knew who "Muffin" was already! I also kept thinking about my mom's chair and how she would do without it. My mom's roommate was sleeping in her bed in the middle of the day. I still had not actually seen her. Before we left, we wanted to make sure my mom would be occupied and when we checked the calendar we learned they were going to be giving hand massages. We asked my mom if she wanted to go and she seemed uncertain as to what it was and whether or not she did. Kristin and I assured her she would like it. She said, "I would!?" and before long she was being pampered with lotion and a nice hand massage. She liked it -- so we left while she was being treated like a queen!!! What a relief!!! Queen Mary was in Good "Hands"!! As I continue to play catch up on the blog, you will be glad to know my last post finally got my mom moved into the skilled nursing community. (In case you have not noticed, I am making an effort to call it a "skilled nursing community" as "nursing home" has so many negative connotations...makes me feel better ;). So, after moving only a few of my mom's essential personal items to her new place, there was one more slightly large order of business -- moving the rest of my mom's belongings out of the apartment she lived in for three years. I had given 30 days notice, but the sooner I turned the keys in the sooner they might be able to find another tenant. Those of you who have been following along will know that my mom's pink crocs were her favorite. You may also remember that after one of her more recent trips to the ER, we decided to hide them as we were certain they were no longer giving her the support she needed to safely walk around. They were well loved, worn and worth every penny. We donated the couch and got rid of the older style tv as it would not fit in her new room. We donated some knick knacks and odds and ends. I took some things home to sort through and keep or give to the appropriate person. Remember when I made the artificial flower arrangement for my mom's balcony for Mother's Day since my mom was not able to take care of real flowers on her own!? Also, the bolster pillow I got her to help with my mom's severe slouching problem!? Thankfully my husband came along with me on my last trip, with his truck. Things went pretty quickly with him making frequent trips to the truck. The emptier it got, the heavier my heart was... Mixed emotions. The relief of having her in a safer place, how much she loved living there, what a relief it would be to have her closer to my house, all the time visiting her with the kids, rushing over there when she fell, spending the nights, the staff, "The Don"... All the trips back and forth for three years... I remembered almost every item that came in and out of her place since I was usually the one bringing them in or taking them away. Each trinket and stuffed animal. Thinking, oh she loved that thing or oh she never even used that thing. The things I had to take away because they posed a danger and the things that I had to get because they became necessities. Apartment 147...was not ours anymore. I had to drop off the keys during normal business hours, so the next day I did...and I never looked back. Well, let's see if I can make this post a little less drama filled...but no promises!! I imagine some of you have read some of my last couple of posts and are thinking, oh my Lord, just move your mom into the nursing home already!!! A valid point indeed! However, since I've managed to detail most of our journey thus far, I want to continue to capture all of my mom's reactions and my feelings along the way. After all, it was a big change for us. As I ended my last post my brother was literally wheeling my mom into the new skilled nursing community. This is where I was afraid it could get awkward... The picture below is what my brother texted to me once he had set up my mom's things and tv. The room is so small that this is literally my mom's portion of it -- except for the chair which my brother literally put in the middle of the room (but we'll get back to that). a two bedroom/two bath apartment to this... Didn't seem possible. I couldn't really explain the way the room is configured, so I drew this "very complex" (ha!) blue print of the room as shown below. Most of the rooms seemed bigger and equally divided in half. I had looked at this room before we moved in, but the truth is you get what you get and I would have taken almost anything that wasn't dirty or unsafe! I don't know why this particular room was configured this way. She was put on the second floor right off the elevator and close to the nurses station. The floor is fairly busy with residents and staff and looks a bit like a hospital. We showed her the room briefly and she was a bit confused, but nothing major. My brother wheeled her around a bit while I tinkered with some things in her room and talked briefly to the staff to let them know she had "arrived". I had also typed a list of all my mom's favorite things and a brief history cheat sheet which I left with the head nurse. I will say, I was not overly impressed with their reaction to my mom's arrival. Everyone seemed preoccupied and a bit underwhelmed by it. I suspected that her 2 pm Thursday arrival the day before the Fourth of July holiday weekend played a role in this. Nonetheless, I reminded myself there were plenty of staff all around and surely my mom was in a safer place. For the record, there are three floors. The first floor is rehabilitation, the second floor is long term care, and the third floor is memory care. Right outside of her door and just down the hall a tad there are some birds to watch. That was one of our first stops. Not sure if you can see the birds, but they are in there and fun to watch. There are also fish aquariums around, too. After a bit of time passed, it was getting a little awkward and we were running out of things to show her. Interestingly, she did not ask too many questions. When she did ask, we would say she is just going to stay here awhile to do some physical therapy and regain her strength so she could walk better. We showed her the room again, but there really wasn't the space for the four of us to hang out there. I have to say I was very bothered that her beloved chair only fit smack in the middle of the room. I didn't have the heart to tell my brother that I didn't think they were going to allow it there. We tried to ask some staff but they were kind of dismissive and said, I think it's ok. I knew Muffin, my mom's chair and the tv were normally a pretty important part of her normal routine. Finally, my brother said I think something is about to happen in the dining room, people are gathering. We checked the calendar and low and behold "Happy Hour" was supposed to be taking place soon. So, we found a table and it wasn't long before my mom was enjoying some snacks. It appeared someone was going to be coming to sing soon! As an added bonus, my niece's aunt works as an RN in the assisted living building attached to my mom's new nursing community. She kindly came down to see my niece and my mom. She is a long time family friend and has known my mom awhile (although she had not seen her recently). She also was instrumental in helping us get my mom into this senior community and for that we are forever grateful! Before long, this guy appeared with his red, white and blue on and was singing away! I remember one of his songs was "Take Me Out to the Ballgame" and my mom was singing away. I glanced at my brother and right then I knew we had pulled it off. Although not what anyone hopes for, her confusion had worked in our favor and allowed us to move her to a safer place. She was content in the moment. After a bit more singing, I let the staff know I would be leaving. I was pretty drained after spending the last five hours together. I actually snuck out before my brother did as I didn't want all of us to leave at once. It was hard, but I like leaving while she is in a fun social situation. Before I even got home, the community called to tell me my mom's chair could not stay where it was and that they would hold it for me in storage. This bothered me a bit because I did not like the idea of my mom sitting in a wheelchair all day and not having "her chair". For the moment, I pretty much had to let it go as my family was also waiting for me so we could travel up north for the long weekend. Below is a quick glance at her new place. I will probably share more pictures in the future. 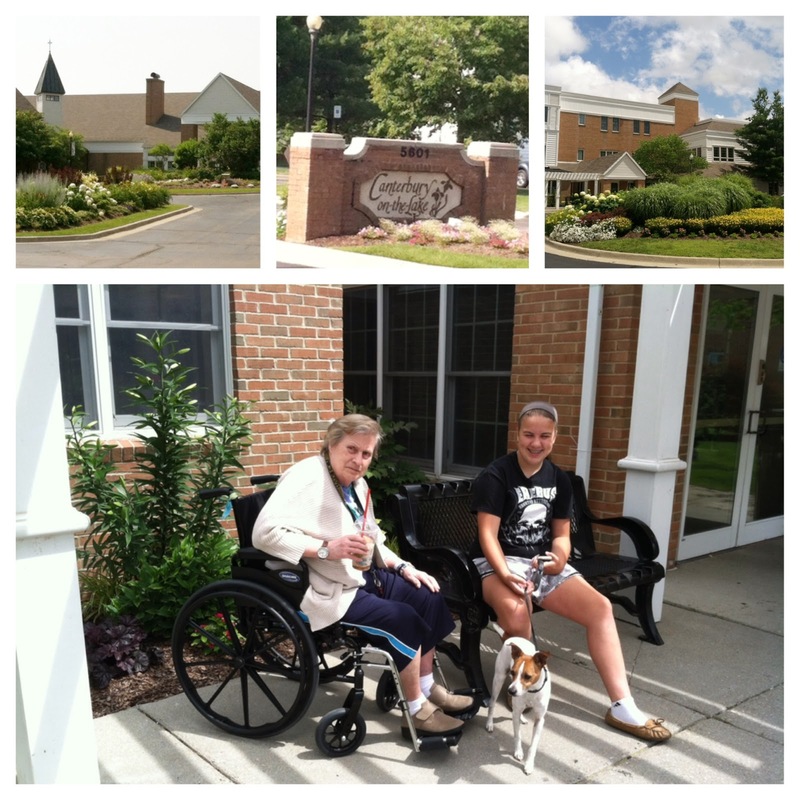 It is a pretty little campus setting with a senior apartment complex, a church chapel, an assisted living community and my mom's skilled nursing community all in one area. The employees are not contracted employees -- they all work directly for the community. Good news -- I did not receive any emergency phone calls while I was up north. As you may recall, there have been a few Fourth of July weekends where my mom has been injured (you could read about one here). What a relief to go accident free! It also gave me some piece of mind to receive a few pictures from my brother who went back for a visit while I was gone. It looked like she was doing ok!! When I returned from the holiday weekend, I visited her again. I had to fill out an inventory of all of my mom's personal possessions. I was relieved that the staff seemed more attentive and seemed to be getting my mom's paperwork more in order. As I began to unwind over the next several days, I realized that after all I had been through these last months and weeks it had, in the end, taken a much bigger physical and emotional toll on me than it had on my mom. She was not particularly agitated and seemed content and only mildly confused. The drama I feared thankfully never happened. There are titles associated with Alzheimer's Disease such as "The 36 Hour Day" or "The Long Goodbye". I definitely see why those are fitting -- it continues to be quite a journey. I call this one -- The Sun Will Come Out - Tomorrow!!!! While I realize it's not Monday, I am playing catch up to bring this blog up to date regarding my mom. As you know, my last post ended with me being informed there was, at long last, an opening for my mom in the skilled nursing facility I was hoping to place her in. Ironically, after waiting a solid six weeks for an opening, I finally learned the nursing community had called me while I was driving on a two hour trip to tour a college with my kids. While chatting my daughter suddenly said, "oh, someone from Canterbury on the Lake called for you yesterday and left a message on the machine!!??" Whaaattttt? Needless to say, I called back right away and then we traded calls for a bit. I texted my brother who had been on "standby" for awhile and told him it was time to make the move. I really felt I needed his help to pull it off. He could do the furniture swap while I occupied and delivered my mom to her new home. He was going to be off work for three weeks starting July 3rd so that's when we declared our move in date. Between trading phone calls and a weekend mixed in, the community was very accommodating in letting us move in on that date. It also happened to be a busy holiday weekend and we had plans to go up north as we do every year. I hoped I would rest easier knowing she would be getting settled in and receiving more care. So, let's backtrack for a minute. Leading up to this, you have to realize my head and heart had been playing a tug-of-war game for awhile. Mostly, I was definitely to the point of realizing I could no longer keep my mom safe in her current living situation (in my head), but my heart would say things like what about The Don, what about Sheri, how will we all be able to visit as comfortably as we do now, what if this walking problem is just a fracture or undetermined injury, how will she adjust from a two bedroom apartment to sharing a small room with a stranger, what if my mom quickly declines as so often happens during a move??? Unfortunately, there was no time to be faint hearted at this point, and I knew that!!!! Despite how difficult it was, I was mostly focused and on a mission. It's a little tricky to move someone who doesn't know they are moving. You can't bring boxes or do things gradually. In the end it didn't matter because the reality is there really isn't that much you need to move when you are going to a much smaller setting. Literally, it became a list like this: Muffin, her chair, some clothes, a small tv, her walker, her wheelchair, bedding and some photos. That was honestly about it. I believe it was two days before the move that I knew I had to tell Sheri what was going on. This was extremely hard, but I owed it to her once the move-in date was settled. Prior to now, I had no way of knowing when or if my mom would be able to move, so I decided it would do not good to tell her of my intent earlier. I had been thinking a lot about how I would tell her. It was emotional, but she was understanding. I told her I would not have been able to keep my mom's last bit of independence as long as we did were it not for her. I had written a letter of recommendation for her and gave her some extra money to thank her for all of her loyalty and support. I would still need her support to get through the next 48 hours. Sheri had spent virtually every single day with my mom for the past eight months. Besides me, she was the only one who knew my mom and her needs so well. She helped me pack a bit and covered for me while I did some organizing and straightening so my mom would not suspect. Being devious like this was not fun, but I reminded myself it was in my mom's best interest. This same day I also had to give 30 days notice to her senior apartment community and let their staff know. In the midst of it all, I also asked Sheri if she could be sure my mom and The Don saw each other before she left. Knowing there would be no real goodbyes after living here almost three years also made me sad...and sad for my mom. All of this was weighing heavily on me knowing my mom really had no idea. The only "loving lie" I could really come up with to tell my mom "where we were going" or "what we were doing" at her new place was to tell her that she was going to physical therapy to get herself strong and walking better. It seemed so lame, but it was all I had. Other scenarios seemed too harsh. Of course, secretly I was hoping she would be confused and not really question things too much, but I could never be sure. Once the morning of July 3rd came, I was trying hard to keep strong and reminding myself that my mom would finally be safe if we could just make this happen. For some reason I stumbled on this verse and I kept reminding myself of it all day long. It helped me get through the day. This is how I found my mom the morning I arrived, Sheri had her looking as fresh as could be and unsuspecting of her big day. To be honest, I almost broke into tears right then, but knew I could not. I had a plan and time frame to make this happen. I packed a few things while Sheri was there, Sheri then took my mom to the lobby where I would meet my mom after reviewing the items that needed to be moved with my brother. Once my brother showed up, it was "show time". I had texted him and gone over the specifics. This was the first time my brother met Sheri. Sheri also told me that my mom and "The Don" sat together at breakfast that morning but barely said a word to each other. I felt better just knowing they had at least been together that last day. It wasn't long before Sheri's normal work shift was over and we discreetly said our goodbyes with every intent of remaining in touch and with hopes she would visit my mom once she was settled. She helped us right to the last minute of her shift. After relaxing for 20-30 minutes I went to pull the car up to the front door. Again, this tugged at my heart -- seeing my mom just sitting and waiting, not knowing. We were leaving her home of three years and she would not be back. We drove around. The new place was only about 15 minutes away. I stopped occasionally to receive texts or to send them to my brother of the progress. I hoped my brother would set things up so my mom would be sure to recognize a few of her personal belongings. I quickly realized there would not be much time for a long lunch so we went to McDonalds drive thru. I knew she would love a frozen pink lemonade -- a combination of two of her favorite things. We chatted in the car and ate our lunch. Eventually, my brother sent a text and photo that the room was set up and ready. Thankfully, my brother and niece waited for us to arrive and met us at the door. Again, I told my mom she was going to physical therapy to get her strong and get her walking a little better. She would just say, "Oh, I am?"